The October Daring Bakers’ challenge is being brought to you by Ami S of Baking Without Fear. 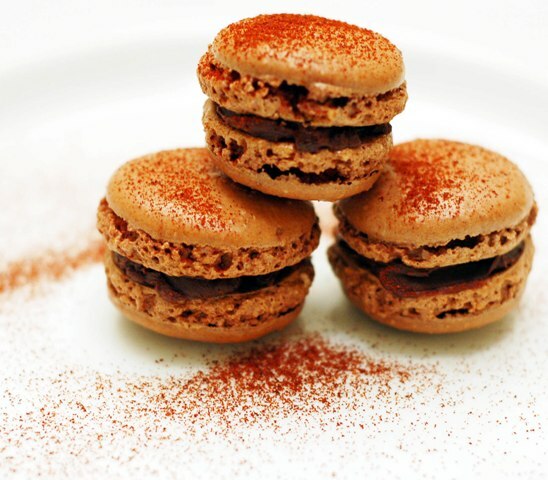 She chose macarons from Claudia Fleming’s The Last Course: The Desserts of Gramercy Tavern, as the challenge recipe. I was really excited as I not only love to eat macarons but I also love to make them. I find it thrilling to wonder if this recipe will work when baked and that is a huge challenge for me. 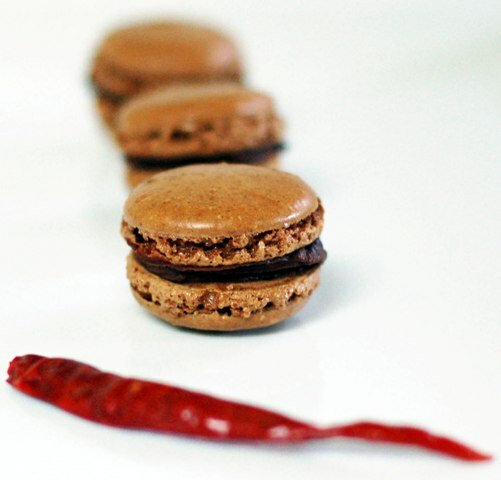 I decided to spice up the traditional chocolate macron by making Bittersweet Chocolate with Ancho Chili Ganache Macarons; spicy and sweet. I love macarons! They are one of the first things I eat when I go to Paris. I love how cute, small and slightly sugary they are. They are perfect with an espresso or even on their own. You can go simple and refined or out of this world crazy with flavor combinations. I have been trying to perfect the macaron for about 3 years now, two of those have been public. I keep thinking that ‘someday’ it will happen. As soon as I saw this month’s challenge, I started the process of planning the flavors I wanted to attempt. I always have a million different ideas and always attempt too many at one time. Since I am in the ‘perfecting’ mode, I decided I had to stick to one flavor; trust me it was hard to hold myself to this plan! I started the macaron process on Friday, by separating my eggs and letting them sit out. I normally let them sit out for 24 hours, even though the recipe said for 5 hours, I still went with the full 24. I felt very good about this coming Saturday morning. I lightly toasted my almonds and hazelnuts, cooled them, and then turned them into flour. My meringues started out soft and by the end of the beating, they were glossy and stiff. I folded the nut flour, sugar and cocoa into the whites and the batter was perfect. Even the piping process was ‘perfect’. I felt good. Then I slide them into the oven, took a couple peeks and nothing. Not a foot, leg, nor a crack or the ever so famous dreidel that mine usually have. These were the flattest batch of macarons I had ever seen. Now, even though, I was disappointed, I did not give up. I tried again and once again …. flat! By this time I was in the mind frame of macarons and damn it, we were going to have macarons. I had the perfect flavor combination and I HAD to make them, I just had, too! So, I walked down to the market, picked up more eggs, separated them, set them aside and pulled out another recipe. Yes, I broke the rules & I am sorry Ami, I just had to perfect this mission. I chose one of Aran’s recipes. I admire Aran and the wonderful sweet delights she shares with us. I have never tried her macaron recipes but decided to give it a try. I turned on some Sia, made a latte, cut my parchment paper and started the process. Once again, everything went very smoothly and the beginning stage of the macarons looked, well, perfect. At this point, I figured anything could go right or wrong. I slide them into the oven and set the timer for 8 minutes; I did not peek, I continued working and waited. “ding”… I slowly opened the oven door, and I was *smiles* from ear to ear, I had FEET and I had damn good looking FEET! Now … it was not the original recipe that the Daring Bakers were supposed to use, yes, I cheated; but, I had some near perfect macarons and I was happy! Prepare the nut flour by grinding the nuts with 1 cup of powdered sugar, in a food processor until the consistency of flour. You will need to pulse the food processor and run it, then pulse and then run. *I did toast my nuts beforehand and let cool completely before grinding. Preheat oven to 300. Whip the egg whites and creme of tartar until they are foamy. Sprinkle in the sugar while still mixing. Continue to whip until stiff peaks form. Sift the powdered sugar, salt, nut flour, and cocoa powder into a bowl. Add to the meringue and fold until a shiny mass comes together. ill a pastry bag with a number 806 tip. Pipe the macarons onto parchment paper. Let the macarons dry at room temperature for 30 minutes (Aran suggests 20, I lost track of time). Bake them for 8 minutes, rotate the baking pan and bake for another 8 minutes. Cool. Remover from parchment and fill with your favorite filling. Bring cream to a boil. Put chocolate into a mixing bowl and pour the cream over the top. Let sit for a couple minutes. Stir until melted. Add the ancho chili powder, stir well. Let sit in the refrigerator for at least an hour before using. 38 Responses to "Bittersweet Chocolate with Ancho Chili Ganache Macarons"
Good for you - these are lovely! Macarons are also one of the first things I eat when I get to Paris too - can't wait til this December when not only will I eat a lot of them but am going to Elysée Lenôtre pastry school for a macaron workshop!!!! WOW! What a great recipe and beautiful pics too! You did it!!! They are spectacular and I am so proud of you (I feel like a mother hen)! And what flavors! Fabulous! You didn't cheat! You used the recipe and then moved on!!! Not only did you get feet, but they were dancing up a storm!!! Your macs are STUNNING! Your macs are screaming gorgeous Denise. Love love love the pictures, the flavours...and the pretty FEET! WOW!! Oh yeay they came out perfect in the end! I don't think it matters that the pretty ones are a different recipe, only that you tried the other recipe to begin with. I love chocolate and chili together and your presentation is beautiful. Gorgeous! I have good luck with Aran's recipe as well - it seems like you just have to go with whatever recipe works for you. Mine is Helen's basic recipe, but to each their own, right? glad you found the perfect recipe! no sense in struggling with something that doesn't work for you. they look fantastic, and i love the flavor! Way to go! Your macarons look beautiful! I love chocolate and chili together. I made 4 batches using the DB recipe and they all flopped! So, I made more using 2 other recipes and they came out pretty good. Still not perfect, though. Wahooo! They look and sound fantastic Denise, well done! I so struggled with the recipe too. I had to make a number of adjustments. I won't use it ever again. Back to Italian, for me! Your macarons look fantastic! Inspirational macarons. You have a classic combination there, with the old world flavors. 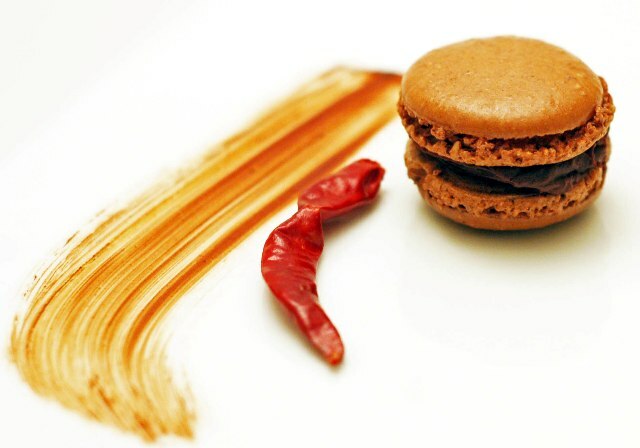 The sweetness of the chocolate with the heat of the ancho chilis and the earthy tones make your macaron money! Love the combo! Can you believe I've never had macarons when in Paris! Gorgeous amazing job! The texture is exquisite - you can see that from the photos. I have yet to tackle macarons - I find them really intimidating. 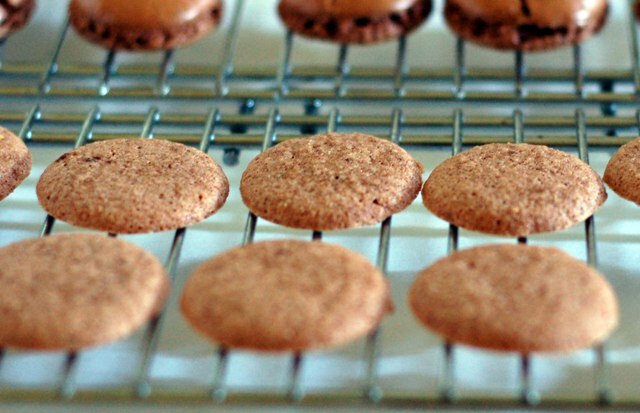 I'm still scared of macarons, baking them that is not eating them! Yours look spectacular and once again you make it all seem so effortless! Since I'm not a baker, I usually pass these posts by (sorry) but this one really drew my attention because of the bittersweet chili ganache. Bravo! They look fantastic! I've never been a fan of chilli chocolate before, but have tasted ancho chilli flavoured ones and loved them. Simply perfect! I love the pairing of chocolate and chili, too.